This weeks prompt is a little different, it's all about highlighting a post you want to promote, and I wasn't quite sure what to write at first as I don't currently have any giveaway's or competitions up, but then I thought, well perhaps now is the time to start one! So first off; this is not a giveaway post, I'm just trying to gauge what you all think on an idea I have for my first one. 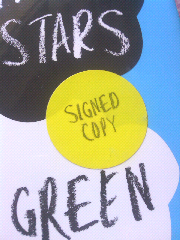 I'm thinking about hosting a giveaway to win a SIGNED, hardback copy of John Green's The Fault In Our Stars. 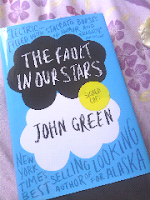 I read a lot of book blogs, so I know John Green is very well known around these parts and that this particular book has gotten a lot of great praise, and I do just happen to have a signed copy so I thought it would make the perfect giveaway. "Despite the tumour shrinking medical miracle that has bought her a few years, Hazel has never been anything but terminal, her final chapter inscribed upon diagnosis. But when a gorgeous plot twist named August Waters suddenly appears at cancer kid support group, Hazel's story is about to be completely rewritten." I'm not sure what the parameters of the giveaway will be yet, but if this sounds like something you'd be interested in then drop me a comment and let me know. Stop by my blog if you like...I have giveaways and a discussion you may want to comment on. In fact, I would like to have your opinion on my discussion. My mum just read that book and loved it, she recommended it to me and I'm starting it next week, via my library. That said, if I scored a signed copy, I'd give it to her for Christmas. If you do a giveaway, I'll be all over it!